Pictured are non-ag members Sam Rooney and Stephanie Selvaggio and ag members Wyatt Teets and Trey Williams. 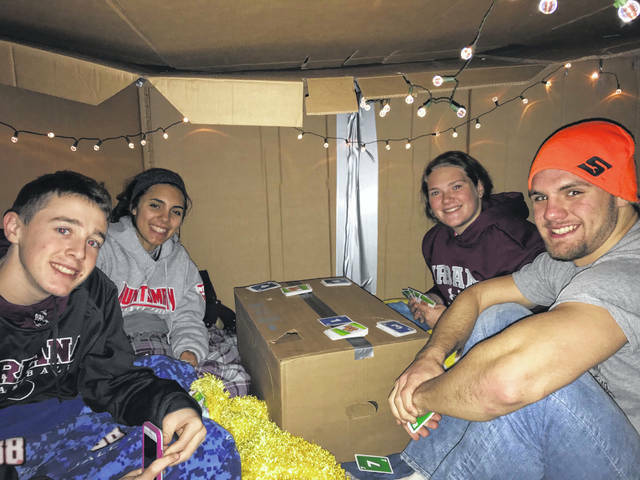 The Urbana FFA chapter held its annual Cardboard City on Nov. 9 to raise awareness of homelessness. The event was open to all Urbana High School students. Students paid $5 to attend the event. The money was donated to the Urbana Backpack program. The Backpack Program is a non-profit program, that is run solely on donations, either monies or kid friendly foods. The program started in our district 9 years ago when the need became such a reality that a lot of students had no food in their homes for the weekends. Sodexo School Services, Urbana City Schools, and The Caring Kitchen, partnered together, went out into the community, and educated individuals and businesses on the profound need in our district. Students made houses for the night out of cardboard boxes, whoever had the most creative design was given gift cards worth $15 to Walmart. The winners were Nick Crumley, and a group consisting of Wyatt Teets, Trey Williams, Stephanie Selvaggio, and Sam Rooney. The chapter provided some food and drinks although the purpose was to show awareness for homelessness, such as hot chocolate, chicken noodle soup, and hot dogs. Submitted by the Urbana FFA chapter.